1. Do we need to chant the names with total devotion and concentration for this to work? What if I am not able to focus or get even a semblance of devotion or concentration? 2. What if mind keeps wandering off? 3. What if I make mistakes in pronunciation? Will it help even if I have all of the above deficiencies? Saints and Rishis swear by the potency of the God's name. But, if we had to trust in our ability to focus or concentrate, it means that Vishnu's name is potent only because of our efforts and not by itself, which is totally incorrect! A fire will burn the skin of the person who touches it irrespective of the person knowing if the fire is hot or not. Medicine cures the person who may not necessarily believe in the potency of the drug. One need not know the recipe of the food to enjoy it. Same way, each of God's names has the potency to help, cure, palliate, comfort and relax the devotee irrespective of his level of advancement. We only need to keep chanting His names! Ajamilan was a Brahmin by birth - Once when he went to forests to collect herbs and grass for his prayers, he saw a prostitute in the forest and fell in love with her. He never went back to his family. He started living an immoral life which also included stealing from the village for sustenance. As time passed, the prostitute gave birth to many kids. When his last kid was born, by God's Grace, a saint came that way, and named the kid as 'Narayana'. Ajamilan was totally in love with the kid. He kept calling him by his name always - Narayana, Narayana! Suddenly, Vishnu Dhootas (Vishnu's messengers) came over and asked the Yama Ganas to leave! Yama Ganas were taken aback! They told Vishnu Dhootas that this guy was one of the biggest sinners and they have all his records. 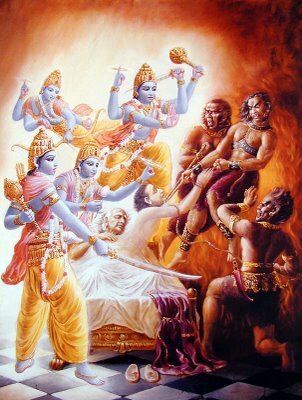 Vishnu Dhootas told them that, even if he had spent a life time sinning, he called the name 'Narayana' during death and so, he cannot be taken to hell. Ajamilan who was witnessing this was stunned. He thought how much better his life would have been if he had spent his whole life contemplating Sri Vishnu! Thus, Ajamilan was saved by chanting Narayana name even though his intent was to call his son! Thus is the potency of Lord's name. I am no way indicating that we can be saved by chanting Narayana's name in our end after spending a life time of sins :-) - Scriptures say that at the time of death, the soul gets into a trance just identical to the dreaming state. Just as we don't have any control on our dreams, we would have no control on our thoughts at the time of death. So, we have to practise chanting Lord's name always! ther ma misai vanthu ethira paduvai!" When Lord of Death approaches in His large and black buffalo, You must come before me in Your chariot of Peocock, and save me! So, please don't worry about mind wandering off! Just make it a practice to chant Vishnu Sahasranamam regulalrly - Mind will indeed be subdued sometime. But, if you wait for mind to subdued to start chanting Vishnu Sahasranamam, it would become the case of the guy who waited for the waves in the ocean to subside to take bath. Carpe Diem! I'll answer the rest of the questions in subsequent posts! Na Vasudeva Bhaktanam Ashubham Vidhyate Kwachit! "No ill befalls the devotee of Sri Vasudeva Bhagawan Vishnu:"